A Victorian Carved Oak cat face Buffet. The buffet is superbly carved there is a back gallery where the cat face watches you from. 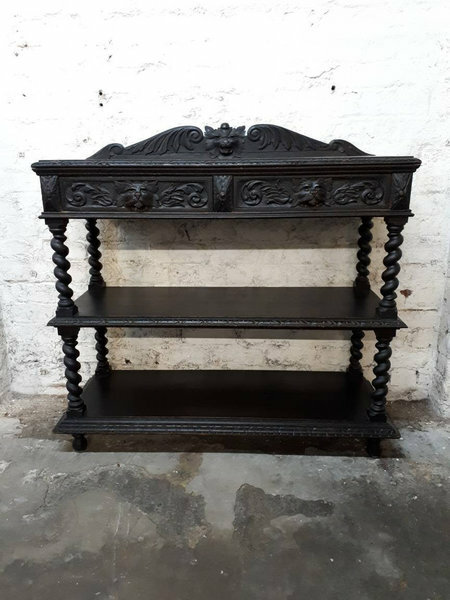 The Buffet has a three tiers, supported on chunky barley twist supports, the top counter has a carved edge, below this there are 2 carved drawers and below this there are two more tiers, This is an attractive piece of victorian Oak and is in fine condition for its 150 or so years of age. dont let the photos fool you, its larger than it looks. hi. thankyou for taking the time to view my items. i try my best to get the cheapest quote possible. i use a reliable currier and give him alot of buisness so it helps keep prices low. it all depends on how many deliveries he has in the area and how populated the area is for example in london he may have loads of drops in a small area so the price is low. if your out in the sticks the price will probably rise. i am happy for you to try get your own quote. We are based in Dewsbury area. This item will be shipped from Dewsbury, United Kingdom of Great Britain and Northern Ireland.